Obv/ Head of nymph Larissa three-quarter facing l., hair confined by fillet and floating loosely. Rev/ Horse grazing r., LARIS above. Larissa was the principal city of Thessaly dominating the fertile plain of Pelasgiotis. In approximately 350 BC Thessaly was brought into the Macedonian sphere. The are was divided into four divisions each one ruled by a Tetrarch appointed by Philip of Macedon. Despite declining political power however Larissa retained considerable economic prosperity a fact Witnessed by issue the Didrachms and later Drachms. 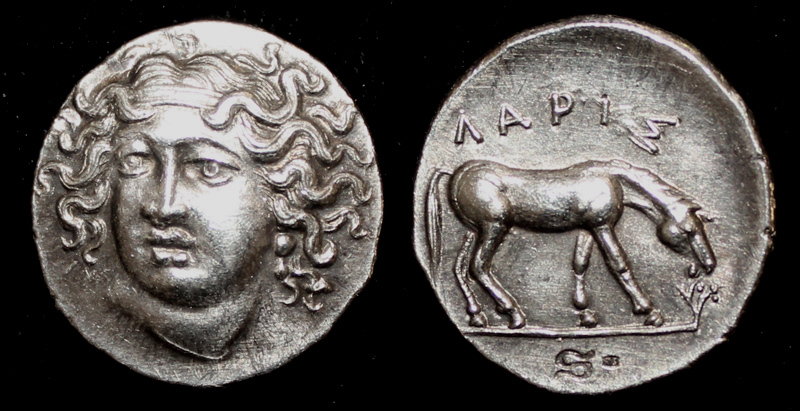 The magnificent head of nymph Larissa was probably copied from the full face of Arethusa on contemporary Tetradrachms of Syracuse. The reverse was of particular local significance. Since the time of Homer Thessaly had been famous for horse breeding. Greek city-states rarely had any decent cavalry. They preferred to hire Thessalian squadrons as the need arose. Such units for example proved invaluable to Alexander in his conquest to Persia.